Here's another press release about a brand new release. You may remember this was released episodically on to mobile phones last year and stars the Japanese girl from The Hostel? Here's the press release in full. We've yet to see this baby so, you know, we're not quite sure whether it's actually a cult classic in the making or not, but we're good to PR people here and always give their press releases the benefit of the doubt. 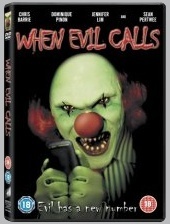 A psychotic clown terrorizes a remote, girls-only boarding school in the British horror, When Evil Calls, available to buy and rent on DVD from 16th June 2008, courtesy of Sony Pictures Home Entertainment. 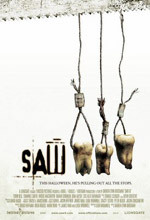 Sean Pertwee (Dog Soldiers, Event Horizon), Chris Barrie (Lara Croft: Tomb Raider, TV’s Red Dwarf) and Dominique Pinon (Alien: Resurrection, Delicatessen) star in this tongue-in-cheek chiller about a clown blessed with the ability to grant people their wildest wishes. Mixing chills with laughs and featuring a cast of familiar faces, When Evil Calls is a definite cult classic in the making. 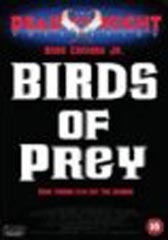 A dodgy 80's Spanish remake of The Birds you say? Sign me up. Angus Macfadyen, looking scarily like UK TV’s Jeremy Beadle, mooches from one ‘task’ to another with little in the way of emotion.